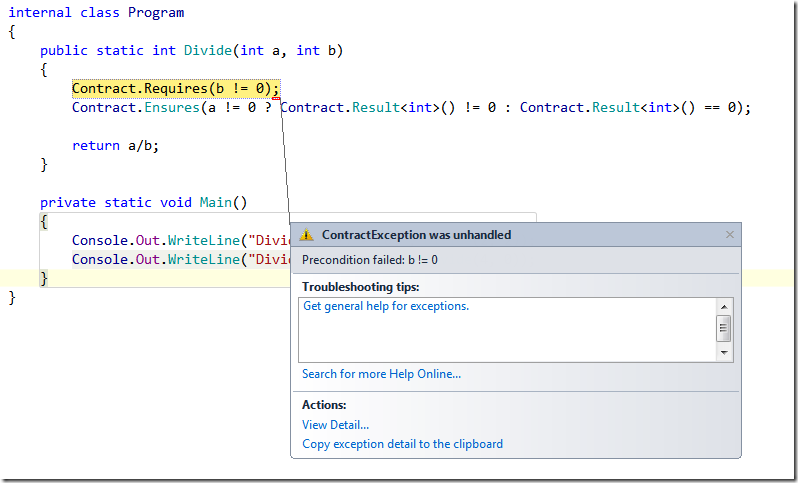 CodeContracts are a new feature to write assumptions in .NET programs. 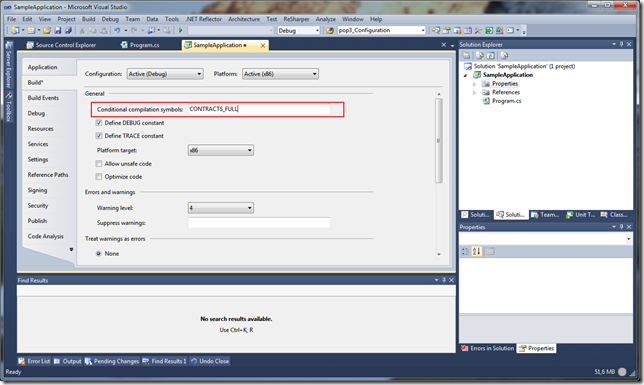 A version for .NET 3.5 is available from the Microsoft Code Contracts. With .NET 4 they are part of the BCL. Unfortunately, they do nothing out of the box – a binary rewriter is required to enable runtime checking. The rewriter is also available from the Microsoft site specified above. 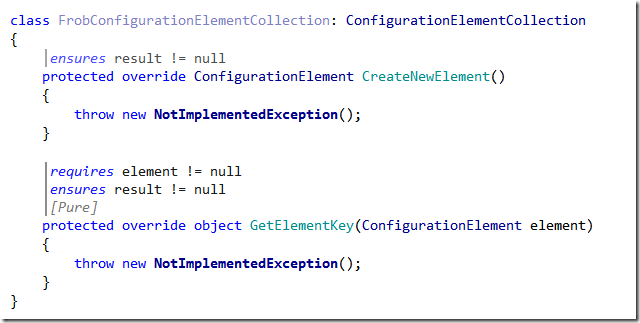 If you are using Resharper, you are accustomed to the null-reference checking the tool performs as you type. This is quite handy to spot null-references during design-time vs. run-time. the warning would be gone, because Resharper would sense that the code path with the if-statement is never executed if name is null. 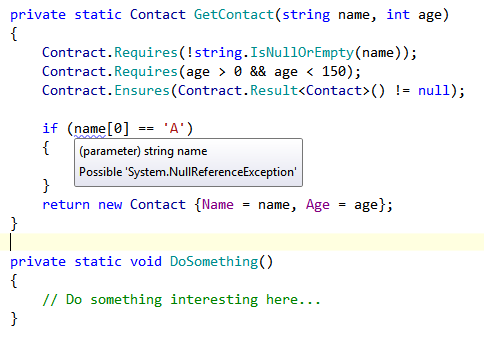 To enabled this feature with Code Contracts, a file with certain annotations must be placed in the directory C:\Program Files\JetBrains\ReSharper\v5.1\Bin\ExternalAnnotations\mscorlib (C:\Program Files (x86)\JetBrains\ReSharper\v5.1\Bin\ExternalAnnotations\mscorlib on x64 systems). The file is attached at the end of this post. A Visual Studio extension is available from the Code Contracts team. It can be downloaded via the Extension Manager. 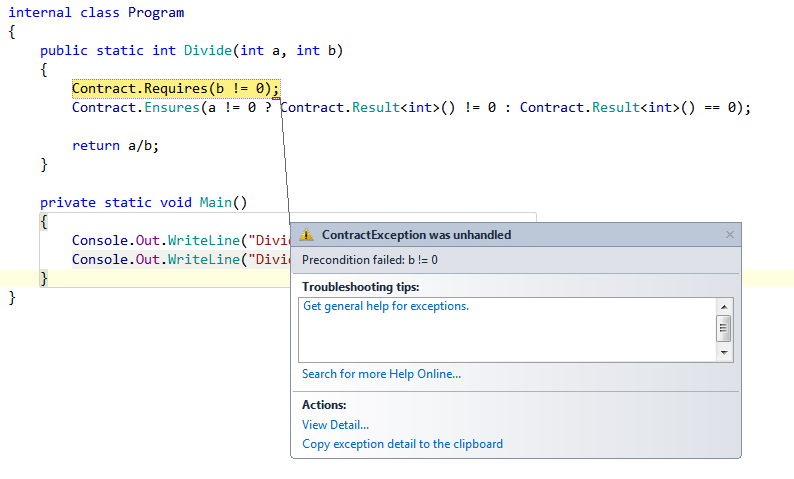 It visualizes code contracts directly in the editor. The Microsoft.CodeContracts.xml is taken from a Youtrack issue http://youtrack.jetbrains.net/issue/RSRP-190566. I’ve modified the file to work with .NET 4.0. If you use a Smartcard for cryptographic operations and get one of the errors above, the error might be in the configuration of your Smartcard Cryptographic service provider configuration. In my case I had a NetKey 3.0 card and got the error “The requested keycontainer could not be found” when accessing the private key. The error “The Local Security Authority Cannot Be Contacted” was thrown when I tried to use a certificate from the smartcard to establish a mutual authenticated SSL connection to a server. The cause for this error was that the key length of the certificate on the smartcard was 2048 bits, but the Smartcard provider had a length of 1024 bits configured in the registry. Open Regedit and navigate to HKEY_LOCAL_MACHINE\SOFTWARE\T-Systems\CardMiniDriverTCOS3\Applications\NKS V3.0\Key1. Set the value of the field KeySize to 2048. After the operation completes, close the Card management tool. 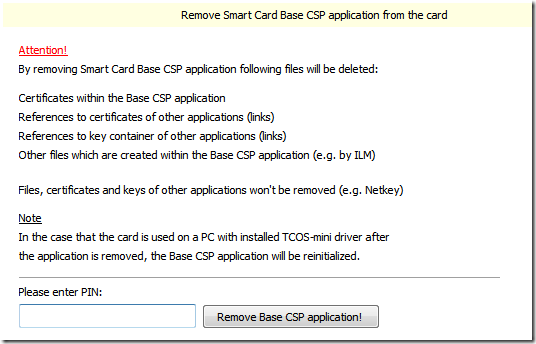 Remove the smartcard from the reader and insert it again. Open the Card management tool again. This will re-initialize the card. 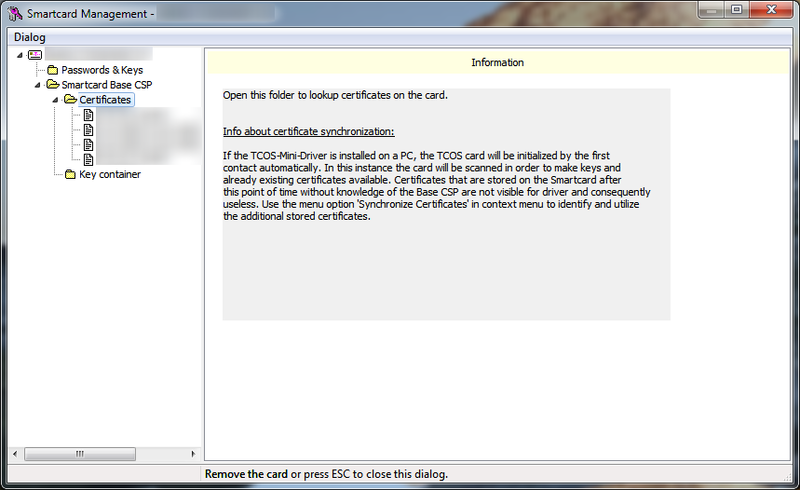 Using smartcards with Windows is not as trivial as I thought it would be. 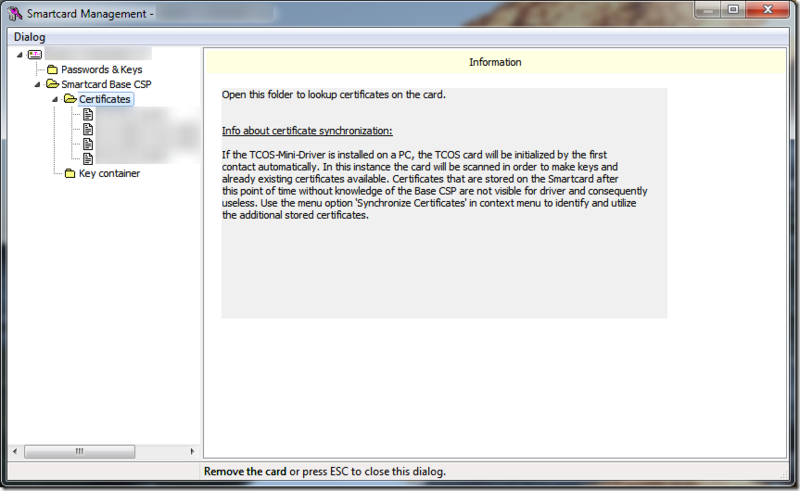 Although Microsoft ships a Smartcard provider for its CryptoAPI for current versions of Windows (an update is available for older versions of Windows), most smartcards cannot be used out of the box. Every smartcard type requires its own implementation of a Cryptographic Service Provider (see http://msdn.microsoft.com/en-us/library/ms953432.aspx for more information). The Netkey type of smartcards is used by T-Systems in Germany. 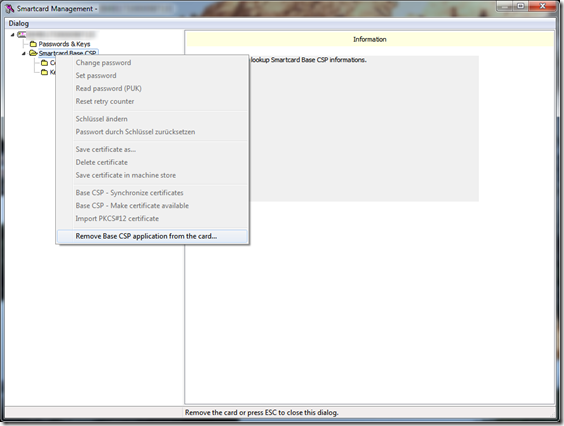 They also offer a CSP module for Windows (x86 and x64) and PKCS#11 interface libraries for Linux, MacOs and Windows. It can be downloaded from the TeleSec website. 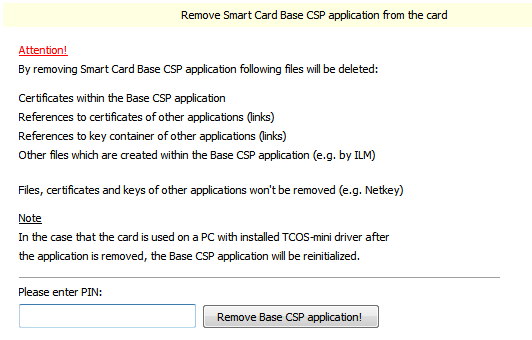 Once the CSP is installed, the Card Management software, which comes with the driver, can be used to map certificates from a smartcard into the Windows Certificate (either the store of the current user or the local machine). Each certificate on the card has its own node. 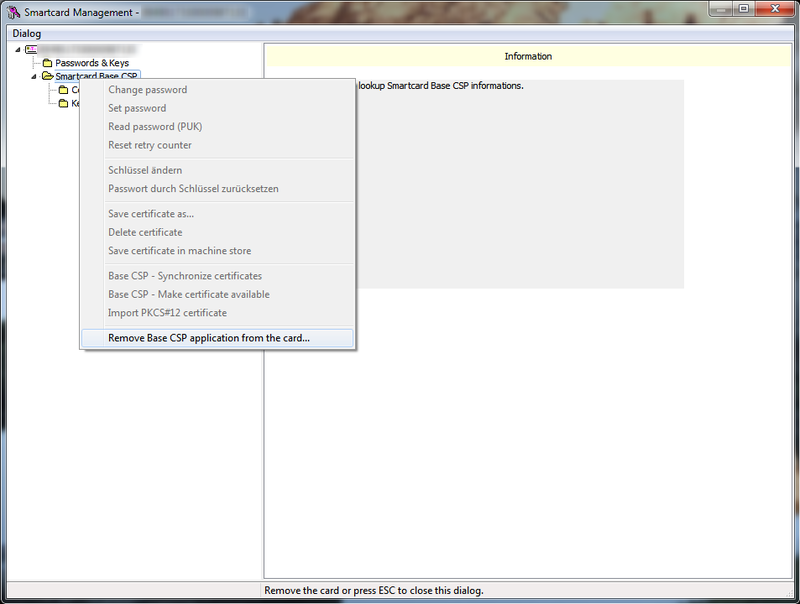 If you click on it, the certificate is displayed in the right view. From there you can import it into the store of the current user. To import the certificate into the machine store, right-click the certificate and select “Save certificate in machine store”. Administrative rights are required for the latter operation. On Windows Vista you must start the Card management software with elevated privileges. This is the third post about the Workflow Foundation 4. The first two posts can be found here and here. In the second article I introduced the IncrementExtension which asynchronously increments an integer value and waits one second each time it is called. The activity used bookmarks to stop and resume the workflow while it is running. The problem is this: When the application is forcefully stopped and restarted, the index will start again at zero. This is a shame, since the workflow instance is already persisted to the database between each call. To save data to the instance store, a unique id for the the data, represented by an XName instance. This can be created using the XNamespace class (see line 13). With this unique id, the data of the extension instance can be persisted to the instance store. 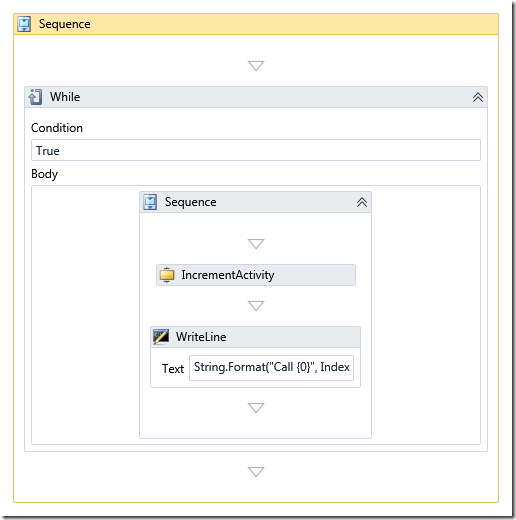 To save the data the extension needs to override the CollectValues method and add the properties to be persisted to the readWriteValues (lines 50 to 56). The runtime uses the DataContractSerializer to serialize the data. 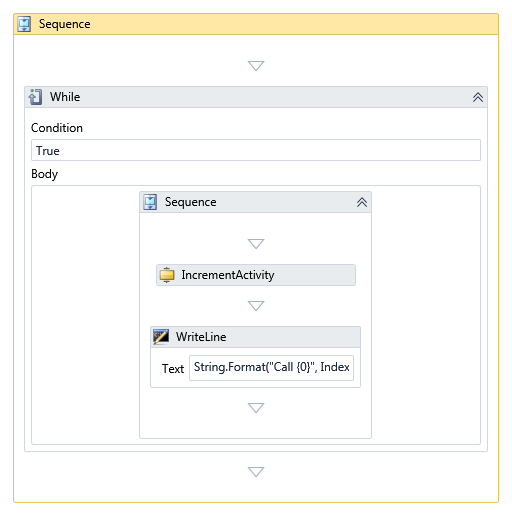 Since .NET 3.5 practically every class that has the SerializableAttribute on its class and/or implements the ISerializable interface can be serialized. At minimum, this method should serialize the bookmark. This is required to continue the workflow when it’s restarted. 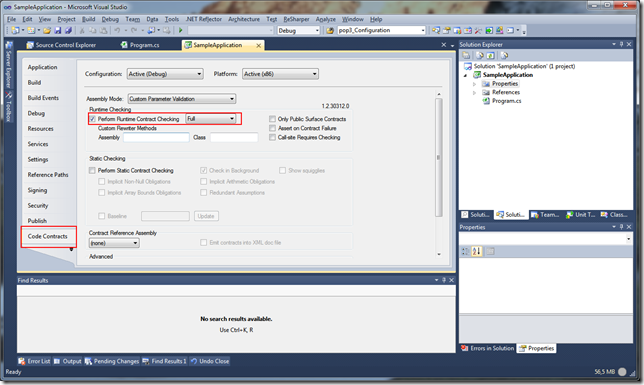 When the workflow is restarted the runtime calls the PublishValues method on the extension to load the instance data from the store (line 59-66). This method also should check whether to resume any bookmarks to continue the workflow. Obviously, this workflow runs very long… espacially, since the custom IncrementActivity waits one second before incrementing the variable ‘Index’. Sure, there are simpler ways to execute a workflow but AFAIK only this method support persistence using the SqlWorkflowInstanceStore. Of course, the id needs to be replaced with the instance id of the workflow. Once the workflow is running, the instance id can be retrieved from the app.Id property (as shown in line 15). 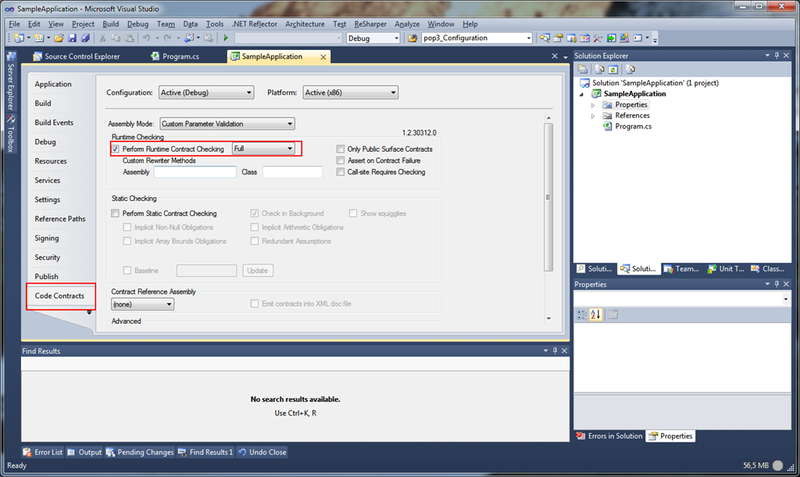 To persist workflows to a database, the necessary tables and stored procedures must be created in a database. This can easily be accomplished with two files from the .NET 4 runtime directory under %windir%\Microsoft.NET\Framework\v4.0.21006\SQL\en. The SQL statements from the two files SqlWorkflowInstanceStoreSchema.sql and SqlWorkflowInstanceStoreLogic.sql have to be executed against the target database.